That's what I was thinking (and half wished I had yelled out my window) after the mini-drama I heard and then saw on the downward slope towards 5th Avenue. A girl, about eight or nine, was racing down the hill on a collision course with 5th Avenue. She was screaming bloody murder, which is what brought me to the window. I got to the window in time to see a man with Key Food bags step in her way to stop her. I don't know if he put his 12-pack of paper towels between them, but considering her speed, he could have been seriously hurt. She tumbled to the ground, he stumbled back and then fell, and then it looked like he was asking her if she was alright. She just sat on the ground, perhaps stunned. Another woman started towards them, but never made it. No one else approached them. A minute or so later (it's always hard to gauge in situations like this one), someone who may have been her mother or an older sister approached them. It didn't look like the very helpful he-just-kept-her-out-of-traffic-man was even acknowledged, let alone thanked. He started saying something, and I would tell you what I would have been saying, but it would need censoring. 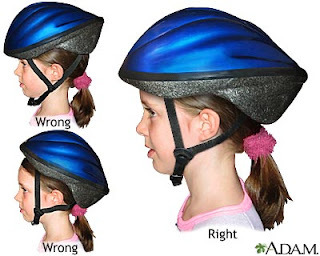 Why wasn't this child wearing a helmet? Why was she riding a dirt bike without manual brakes? What was she doing riding down the hill in the first place? I know, kids do silly, naughty, crazy, dangerous things. And I'm sure I'll eat my words when my son gets to be old enough to ride a bike down a hill towards traffic. But I'll tell you right now, I might have thrown my 12-pack of paper towels in her way to stop her or at least guide her into a parked car in stead of a moving one, but I would not have jumped in her way. Uh-uh. Am I evil? Perhaps. I won't be getting a free ride to Disneyland anytime soon, that's for sure. All I was thinking (after I saw she was okay and walking her bike back up the hill, perhaps for another go) was what if my kid had been toddling up the hill and she ran into him? What if she had run into someone head-on and permanently maimed the person? What if? What if? The supposedly responsible adult should have been giving the girl a stern talking-to instead of laughing all the way up the hill. At the very least, the guy who risked injury deserved more than the brush off he got. He'll probably be feeling it tomorrow. Alrighty. The soapbox is returning to the hallway closet.